Individuals with disabilities are ABLE to save for their own future. The message to families is clear. Individuals with disabilities are finally ABLE to save to help support their health, independence and quality of life (see Learn the Basics below for more information). For families, it is important to plan and save for the future of your child with a disability, just as you would for the future of your typical child. Demographics point to a growing population of individuals with disabilities while the ability of the government to provide supports meeting the needs of all is limited. 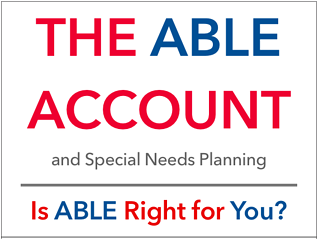 The ABLE Account is one savings option for families and individuals with disabilities to consider in their planning. Up-to-Date Information -sign up for our blog: Click here. The ABLE Account is but one tool families can use to plan for the future of their loved one with a disability. To learn more: Planning Options for Families. How do I plan for a secure future for myself and my family member with special needs? Contact us. John Nadworny has been quoted extensively in the press and authored several articles on the applications and limitations of the ABLE account in planning for individuals with special needs. ABLE National Resource Center, John and James, August 2017. The opinions voiced in this material are for general information only and are not intended to provide specific advice or recommendations for any individual. Investing involves risk including loss of principal. No strategy assures success or protects against loss. Prior to investing in an ABLE account investors should consider whether the investor's or designated beneficiary's home state offers any state tax or other benefits that are only available for investments in such state's ABLE program. Withdrawals used for qualified disability expenses are federally tax free. Tax treatment at the state level may vary. Please consult with your tax advisor before investing. Entities in the video are not affiliated with LPL Financial, special Needs Financial PLanning or Shepherd Financial Partners, LLC. ABLE National Resource Center, Understanding the Investment Side of ABLE, November 2016. Journal of Financial Planning, Incorporating the ABLE Act into Special Needs Planning, John W. Nadworny, May 2015. Law Professor Blogs Network , The ABLE Act Provides New Alternatives to Help With Disability Planning, Monday, May 11, 2015. 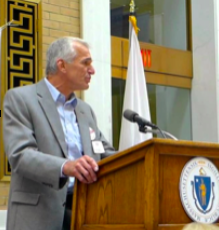 The Advocate, the ARC of Massachusetts,“Practical Perspectives on the ABLE Act”, an interview with John Nadworny CFP® and Fred Misilo of Fletcher Tilton, Attorneys at Law. The Boston Globe, A disabilities act, long in planning, is finally law, January 2, 2015. FPA SmartBrief.com, Advantages and limitations of ABLE accounts, May 19, 2015. Nerd’s Eye View, Weekend Reading for Financial Planners, May 9, 2015. BayState Parent, the ABLE Account, Planning Ahead for Families with Special Needs, June 2016. There is no assurance that the techniques and strategies discussed are suitable for all individuals or will yield positive outcomes. Investing involves risk including loss of principal. Prior to investing in an ABLE account, investors should consider whether the investor's or designated beneficiary's home state offers any state tax or other benefits available for investments in such state's ABLE program. Consult with your tax advisor before investing.